YAKIMA COUNTY, Wash. – Local Fire crews were dispatched at 1424 hours to the area on the 800 block of Suesanna, just outside of the Naches area. The cause is unknown at this time and is under investigation. 1513 | New fire. 10 acres. Burning on Clemens Mountain, outside of Naches. Fire District plus DNR air and ground resources responding. Original resources included Ahtanum 20 crew, H-343, SE-521, SE-540, SE-POLLACK. 1520 | Burning on Clemens Mtn, outside of Naches Fire District. 1 helo, 3 engines responding. 1557 | 200 acres. 7 engines, 2 bulldozers, 1 crew and 1 helicopter en route. 1605 | Fire elevated to a 3-alarm wildfire by Fire Incident Commander (IC). South Puget Sound Wildland Team is activated as part of the State Mobe team. 1621 | Fire had reached 200 acres, with 0% containment status. Evacuations were in effect. 1634 | Conrad ICP is located on Box Canyon. Additionally, there were engines sent from Yakima FD, West Valley, Yakima County Fire District #5. Per Fire Dispatch, they had maxed out all engines for the Upper Valley area. 1639 | Staging is at 21 x Conrad Road. 1647 | ICP located at the west end of Suesanna. 1648 | Tender 42 arrived o/s. 1702 | Nearly 50 homes evacuated in the area of Box Canyon and Conrad Roads. 1807 | 1,000 acres. Air tanker and lead plane en route. 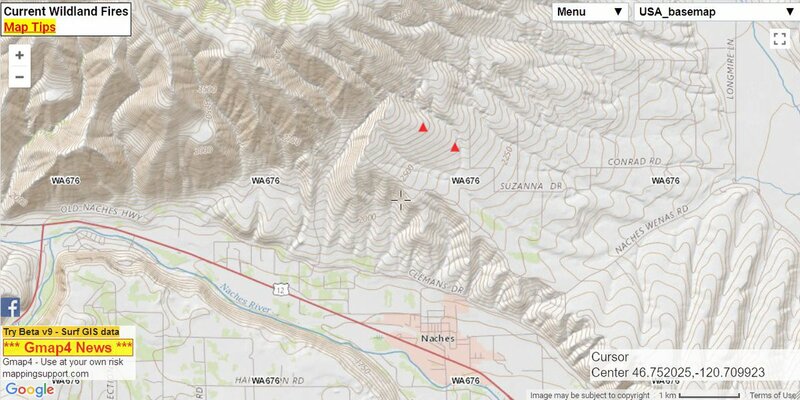 1808 | Shelter Location is Naches Middle School. 1825 | State Mobe approved for 1,500 acres, near Selah. Homes, crops, infrastructure and power lines are under direct threat. 50-75 homes under Level 3 evacuations. WA State EMD partially activated. 1859 | Spokane Co FD8 Division Chief en route, part of the SE WA IMT and DNR team. 2043 | Fire is beyond structures and burning in south Wenas. Apparatus released as warranted. WA DNR, Spokane County Fire District 8, Fire Mobe units.